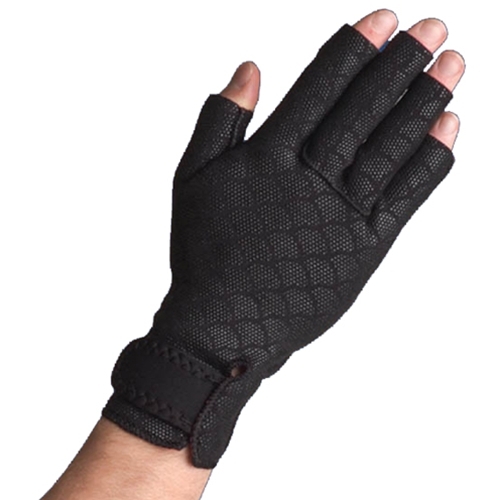 Swede-O Thermoskin Arthritic Gloves from HealthyKin.com are anatomically shaped and secured with a Velcro fastening. They provide warmth and even compression. A Velcro closure allows for added comfort and fit and the outer layer is textured to provide additional grip. Sold in pairs. Makes my right hand feel so much better.I just had hand surgery and I do show some signs af arthritis in that hand. They worked great for my husband! His hands get numb at night and the gloves really help. These helped me and my mom. They do work. Definitely made my joints feel better. I found I had a problem with moisture inside the gloves and had to only wear them at night. When I first began wearing them I was really impressed with how much they helped ease my arthritis in my hands, including "trigger finger", but they are not holding up well as they have started to unravel at the seams along the fingers, which means I will soon be taking them to my local seamstress to be repaired. This is the only serious problem I have encountered. My score would have been higher except for the unraveling at seams. Great product - this is my second pair and I wear them every night during the colder months. Gloves are difficult to put on and take off. The Velcro is to short for my wrists and painful to close and open which adds to the pains in my thumbs and wrists. (Also the Velcro picks up the RED lining and makes the gloves look sloppy.) I keep trying to wear them but find them uncomfortable and add to my pain. Wool lined leather gloves are better for me; they are firm, soft and warm.